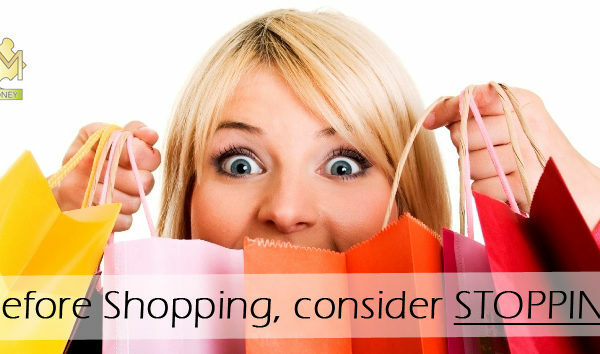 Before Shopping Consider Stopping - Women and Money Inc.
« Are you a woman in debt? Shopping has become one of the worlds’ favourite pastimes but is also a huge contributor to debt and financial difficulty. Fortunes are spent, unneeded items are bought, and cash registers continue to ring. Consumers seem to have an unquenchable desire for more things. When one credit card is at its limit, another account is opened. What is more, advertisers fill the media with attractive items, special discounts and catchy slogans. It is no wonder that personal debt is growing out of control and savings accounts are empty. Something must be done and good news. You have the power to take control! The desire for material things starts long before shopping ever begins. Those catchy ads and discounts pre-sell you, the prospective shopper, long before you ever reach the store. Consumed by desires instilled by promotional barrage, you trek off to the store armed with an arsenal of plastic charge cards to make those cash registers ring. However, if you want to control your debt and your financial life, you must to learn to control your wants. Wanting too much, too often, can be very costly. Doing without something you want is not a new concept. Every family, at some time or another, experiences the necessity to cut back and curtail spending. It is easier to cut back when there’s an important goal to achieve or a necessity arises. But, living long-term with a “don’t want” mentality is more difficult because it really is such an emotional experience. The reality is controlling your finances is not just about money; it is about your life and well-being. Don’t ignore the very real emotional impact and reward of stopping your shopping. Far too often wants are driven by the desire to have what others have. This has been referred to as “keeping up with the Joneses”. Whoever your “Joneses” are, they should have little or no influence on your spending. What others do and have should not control or even influence what you purchase. Achieving your own financial happiness and well-being should be far more important. Don’t define yourself by what you have; it is who you are that matters. In the long run, the great confidence that you develop from gaining financial self-mastery will mean far more to you than a few new things at any given point of time. Make who you are and what you want to become be the determining factor in what you really want. A bright young woman of 40 once laughingly said that she likes to go shopping because, for her at least, it feels like therapy. By this she really meant that shopping makes her feel good. She quickly noted that she fully realized that was faulty thinking and that feeling good wasn’t always the same as being good. She noted that excessive spending has caused her charge cards to blossom and her savings to decrease. She now limits the amount of shopping she does to the amount of cash in her pocket. Living on a cash basis may not provide the same “therapy” but it does limit her debt and the financial pressures that came with her earlier habits of overspending. Personal joy and true happiness can come from many things. Lasting feelings of joy come from your family and other important relationships. Financial goals and objectives, meaningful hobbies and recreation, life-building skills and talents are far more gratifying than purchasing something new that will lose its value and importance over time. Placing importance on important things will help stabilize your financial judgments and help you avoid the temptation to purchase something unnecessary and add to your financial obligations. Remember, only you can really determine what is important in life. You make those decisions. Acting upon this principal can save you from financial disaster. This entry was posted in Blog, Saving Money. Bookmark the permalink. Both comments and trackbacks are currently closed.